Vancouver, B.C… Corvus Gold Inc. (“Corvus” or the “Company”) - (TSX: KOR, OTCQX: CORVF) announces its most recent intercepts from a newly identified structural zone on the west side of the Sierra Blanca deposit approximately 700 metres west of the YellowJacket deposit (Table 1). This new zone of gold and silver mineralization occurs along a major north-south structural zone and intersects with the new Rhyolite Zone. Mineralization found at both the Rhyolite Zone and NW Sierra Blanca is adjacent but outside the defined resource at both YellowJacket and Sierra Blanca. This newly identified mineralization at NW Sierra Blanca is covered by shallow pediment and represents another blind discovery near the western range front of the large Sierra Blanca/YellowJacket deposit. The current drilling covers about 200 metres of strike length with additional follow-up drilling scheduled for later this month (Figure 1). Figure1. Drill hole map showing the new NW Sierra Blanca and Rhyolite Zones with new drill hole locations and select intercepts. The new NW Sierra Blanca Zone is covered by a thin (<20m) veneer of post-mineral, volcanic rocks and gravels. 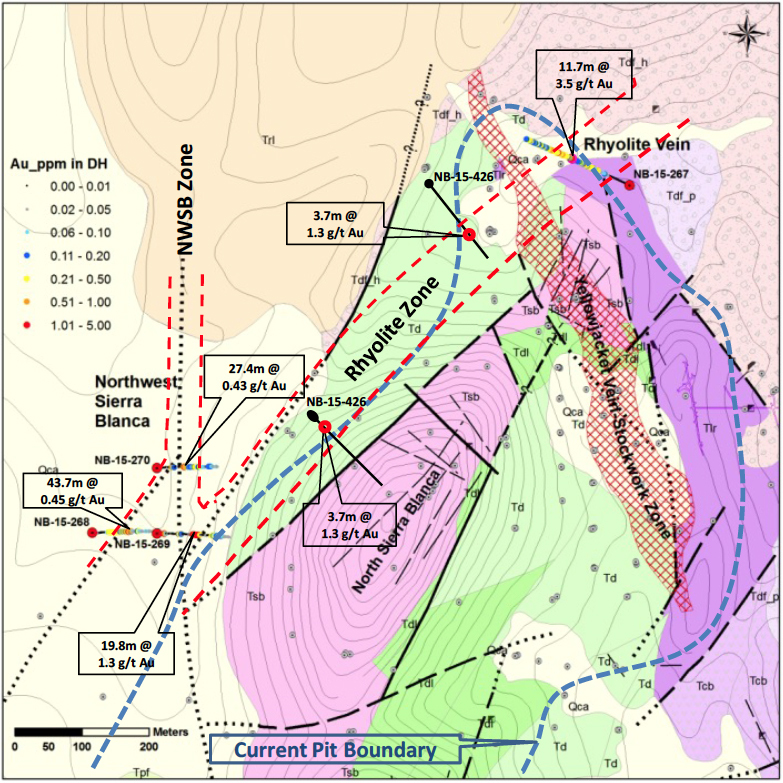 The zone appears to be dominated by two structural zones, the north-south NWSB zone and the NE trending Rhyolite Zone. The intersection of these two major structural zones was hit in hole NB-15-269 that returned a broad intercept of +1 g/t with stockwork mineralization at less than 100 metres vertically in the system (similar to upper levels of the YellowJacket system). Gold and silver mineralization in this area is a mix of replacement sulfide/oxide material surrounding quartz stockwork zones that are controlled by the two large structural zones. The north-south NWSB structure extends north out of the Air Track Hill area where it was hit in prior drilling and projects through the intersection with the northeast trending Rhyolite Zone and continues to the north under cover. Follow-up step out holes along strike to the north and south and down dip are currently being drilled in this encouraging new target area. 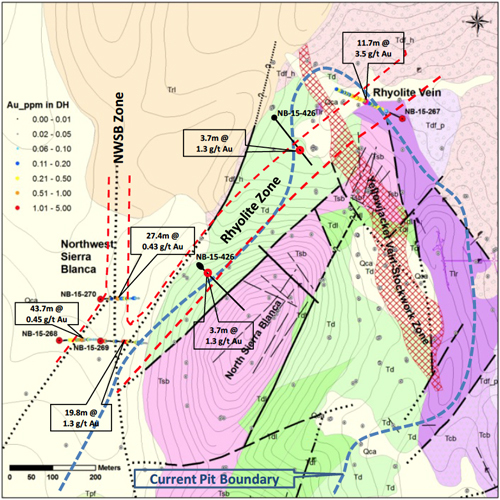 The emergence of this new zone of mineralization that is controlled by known major mineralizing structural trends in an unexplored part of the property is encouraging for the discovery of new high-grade vein systems. The shallow cover in this area was key in concealing the system from previous explorers. The majority of the new mineralization drilled this year in the Sierra Blanca/YellowJacket area is outside the current resource and bodes well for potentially expanding the overall deposit.